Oct 06, 2018 9:00 am TBS Lagos, Nigeria. Adopted by the International Dyslexia Association (IDA), Board of Directors, November 12, 2002, the Dyslexia Awareness Month happens each year October with a universally specified week for dyslexia advocacy and activities. This year, Dyslexia Awareness week ran from Monday 2nd October to Sunday 8th October 2017, with our personalized theme “Dyslexia Counts”, and the World Dyslexia Awareness Day took place on the Thursday 5th October 2017. The purpose of the Dyslexia Awareness Month is to raise awareness and advocacy on dyslexia as well as create a dyslexia friendly society for all. The campaign theme we worked with through the month was “Dyslexia Counts” and the agreed hashtag used to raise awareness together was #dyslexiacounts2017. The campaign theme “Dyslexia Counts” provided an overview on the importance of dyslexia with a clear message on personal positive affirmations; debunking the myths of dyslexia; or reiterating success stories of highly successful dyslexics against all odds. One Word Africa (O.W.A.) 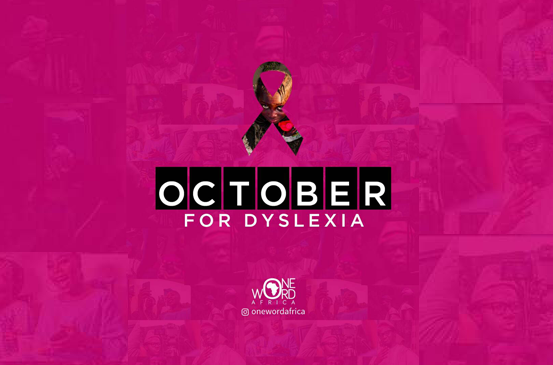 is a Non-Profit, Non-Governmental Organization, and a Dyslexia-Focused initiative formed as a catalyst to address crucial issues affecting learning development in Africa at large and Nigeria in particular. Kindly subscribe to our newsletter.